Pruning. It’s often feared to a fault. In fact, I have a good friend that is a self-proclaimed “prunaphobic”. On the other hand, some people think nothing of shearing off shrubs since they are clueless to the adverse cause and affect of their actions. Then there are others that seem to have too much time on their hands. They’re the ones that create geometric shapes, usually in order to cover up the fact that what they planted is too big for the location. The gumball, triangle or cubed hedgerow is often the result. You should know that I’m a big fan of pruning and I love to do it myself. I understand why it’s needed (to control shape, encourage more growth or blooms, or improve health). With the proper knowledge, pruning is good for your plants and shrubs, even trees. Just ask Tracy DiSabato-Aust. She’s spent many years studying the cause and effect of pruning perennials. She didn’t get the nickname of “Tracy Scissorshands” for nothing! 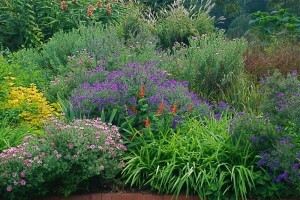 She’s the author of the best selling book; The Well Tended Perennial Garden. Just know that if you ever go to visit Tracy, brush up on your botanical Latin first. It rolls off her tongue like butter and adds a hefty dose of credibility to what she does with a pair of pruners. On the day we showed up to tape our segment with her, we arrived an hour early for the shoot. Normally that shouldn’t be a problem but considering it was only 6:45 AM when we showed up, we caught Tracy still in her workout clothes and feeding her animals. She’s a world-class triathlete so she has a lot going on. Obviously her days start very early and this was no exception! But as expected, we learned much this day on a few of the many reasons to prune and how it can work to increase the number of blooms, delay flowering, or improve the overall health of the plants. She’s a wealth of knowledge and experience and we were happy to showcase her great skills. Now, if you really want to know what ticks me off, try topping your trees! 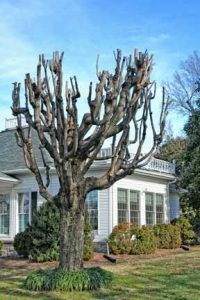 In stark contrast to the many benefits of proper pruning, tree topping is the biggest crime against horticulture there is. And in my town, it is rampant! I hate tree topping. How it became such a popular and ongoing thing to do, I’ll never know. But I suspect, some bozo with a chainsaw and pickup truck goes around and tells Mrs. Jones it’s time to top her trees. Somehow he convinces her it’s a good thing to do so she allows the mutilation and ultimate death of her trees, at the hand of some ignorant chainsaw wielding idiot! Even worse, as a herd mentality, all her neighbors do it too! Can you tell I hate tree topping? I had no shortage of examples to show when we drove around one morning in my town to shoot this segment for the show. My only regret is that we didn’t shoot this early in the year so you could see the real mutilation and disfiguring that occurs when those guys go around and mangle those trees. Just so you know, if you do this, your trees will eventually die. If you need more information, click on the link to my article on tree topping. This is a sticky wicket for sure! Our guest on the show for this segment was Billy Goodnick. He’s a Landscape Architect and garden writer with a real aversion to shearing plants, shrubs and trees into unnatural forms. I share his disdain. But after his shoot in L.A. for our segment, his Facebook post received quite a bit of commentary and controversy. Some of the comments and rightfully so, felt we were poking fun at people who happened to have a different opinion on what looked good when it comes to the shape of their plants. As the producer who needs to remove his personal opinions, this troubled me a great deal. Although I don’t like cubes and gumballs on plants, it’s not my place to say someone else is wrong for doing it in their own landscape. Ultimately, I had to make the decision to remain neutral on this one so as not to appear condescending of someone else’s choice for how they design their garden, assuming their decisions do not harm the health of their plants. Anyway, if I’ve been a little too wordy, here’s the bottom line: Tracy’s a pruning genius, “prune” your shrubs however you like, as long as you’re not harming their health, but don’t ever, EVER top your trees. Because if you do, with rare exception, you’ve just sentenced them to a slow death. I worked for a landscape architect while, completing college. Every February I was sent out into the orchard to cut the suckers off the apple trees. We never killed any trees. We cut off any branches that were at a 45 degree angle to the main trunk. We encouraged branches to grow at a 90 degree angle; so that in the vent that the branch wold break from the fruit ,fromit would not kill the tree by cracking the main trunk. I have to take a pretty hard stance on the whole shearing controversy. To me pruning is any removal of plant material to alter shape or remove dead parts. Shearing is the clipping of branch tips to create a shape. 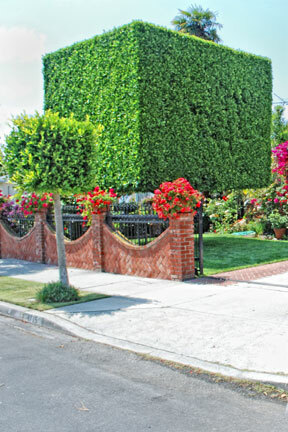 This includes topiary down to a simple box hedge. Yet, with the massive amounts of heavy particulates that are belched out of a pair of poorly maintained hedge trimmers, one must take the ‘neighbors’ into account. Gas powered hedge shears should be banned. I said it! The aesthetics of a plants shape is the beauty in the eye of the beholder. Shear away. Just consider the air pollution created by gas hedge shears. 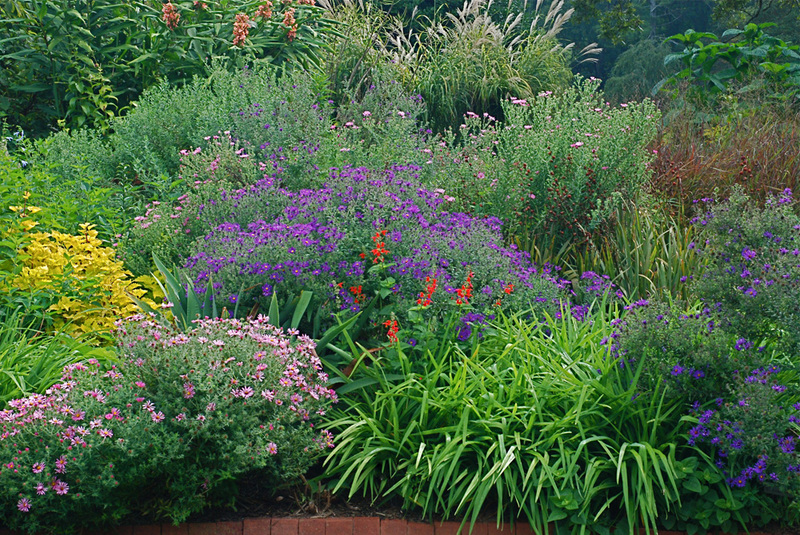 Proper balance of growth habits is the key to a good landscape design. More folks should shear with hand tools. They’d get into natural pruning real quick. I saved your article on soil testing in the Orange County Register this month but can’t find on your website the U of Georgia form to use for an analysis of my soil. Can you help me? Sure Ann. But you’ll actually want to contact your Orange County Cooperative Extension office since each state may have a different protocol for how and what they use for testing your soil. Give them a call and I know they’ll be able to help you. And to make it just a bit easier, use this link to find the office near you. Good luck! Like the both of you, I don’t particularly care for closely sheared shrubs in geometric shapes for my landscapes. But if others like it and it doesn’t impact the plants health, I am okay with it to a degree. Some shrubs can handle this type of pruning/shearing. Boxwood comes to mind. But some shrubs natural growth habits do not lend themselves to this. Forsythias and large Indica azaleas are two examples for me. Where I tend to get an eye twitch is when someone has transformed forsythia’s lovely arching vase like habit into a square box. It’s generally compounded by pruning at the wrong time and there are no blooms to offer any redemption. Just my thoughts. Totally agree Billy. Thanks for adding that important point! And thanks for your contribution. Lots of fun. Joe: Nice job on the big perspective regarding pruning and nice to see how the three pruning segments fit together. Yes, you walked a fine line and I agree with your neutral stance. I would add one more point – aside from “beauty in the eye of the holder” regarding the aesthetics of pruning, and the Horticultural Hippocratic Oath (I made that up – there’s really no such thing that I know if, but I do that a lot; make things up) “do no harm” to your plants, I would add one more: Do no harm to the environment. Wrong plant / wrong place often leads to an over-dependence on fossil-fuel-powered tools (and the pollution and noise they generate) and greenwaste going into landfill if it isn’t composted. It’s a tangled web. Again, thanks for having me on the show and for all the fun we had making it happy. And all my best to the crew, The Divine Ms. L (Theresa Loe), that smokin’ hot chef (just picked up some apricots this afternoon and flying to Madagascar on the red-eye to pick my own vanilla beans) and Patti’s radiant smile while showing that apple tree who’s the boss. Later, skater – can’t wait to see you in your brim in Dallas for the Garden Writers Assoc. shin-dig.